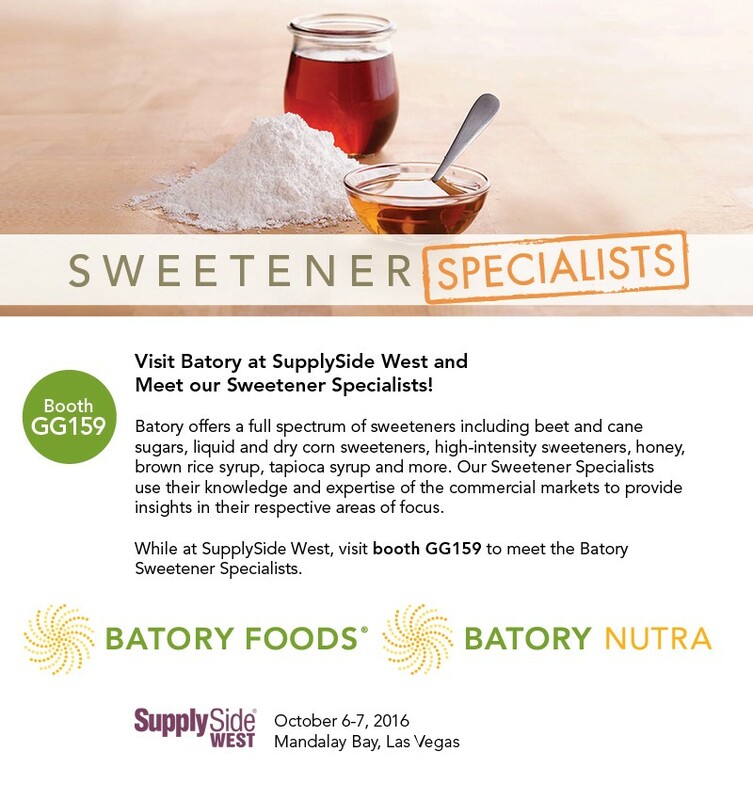 While at the 2017 IFT Expo, visit Batory at booth 1650 to meet with a member of our Sweeteners Team and learn more about how we can help you find the right sweetener - in the right quantity - for your formulation. See below for a list of days and times our experts will be available. While at the 2017 IFT Expo, visit Batory at booth 1650 to meet with a member of our Protein Team and learn more about how we can help you source a single protein ingredient or a full complement of plant-based or animal-based proteins. See below for a list of days and times our experts will be available. Opening of the new 750,000 square foot facility is planned for this Spring. Batory offers a full spectrum of sweeteners including beet and cane sugars, liquid and dry corn sweeteners, high-intensity sweeteners, honey, brown rice syrup, tapioca syrup and more. Our Sweetener Specialist use their knowledge and expertise of the commerical markets to provide insights in their respective areas of focus. At Batory Nutra we offer a powerful mix of the highest quality protein products and industry knowledge to make your formulation a success. 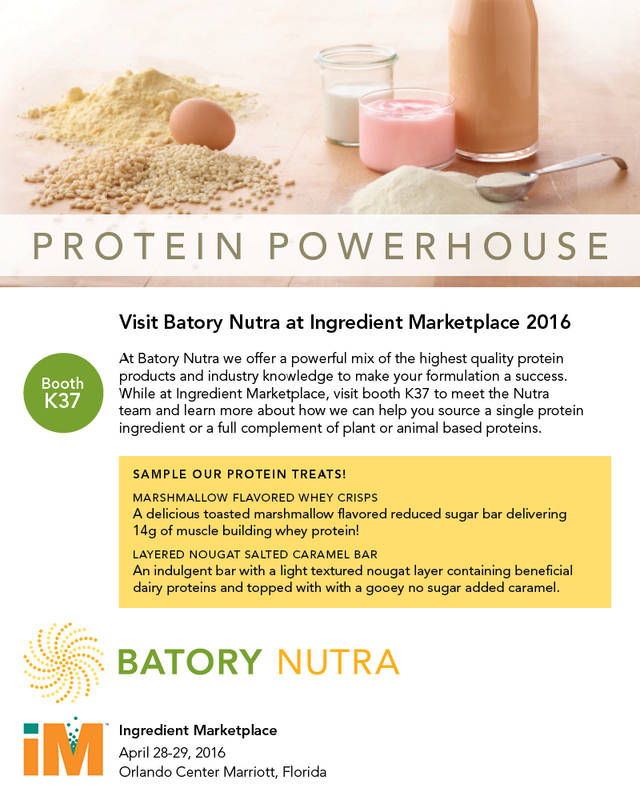 While at Ingredient Marketplace, visit booth K37 to meet the Nutra team and learn more about how we can help you source a single protein ingredient or a full complement of plant or animal based proteins. 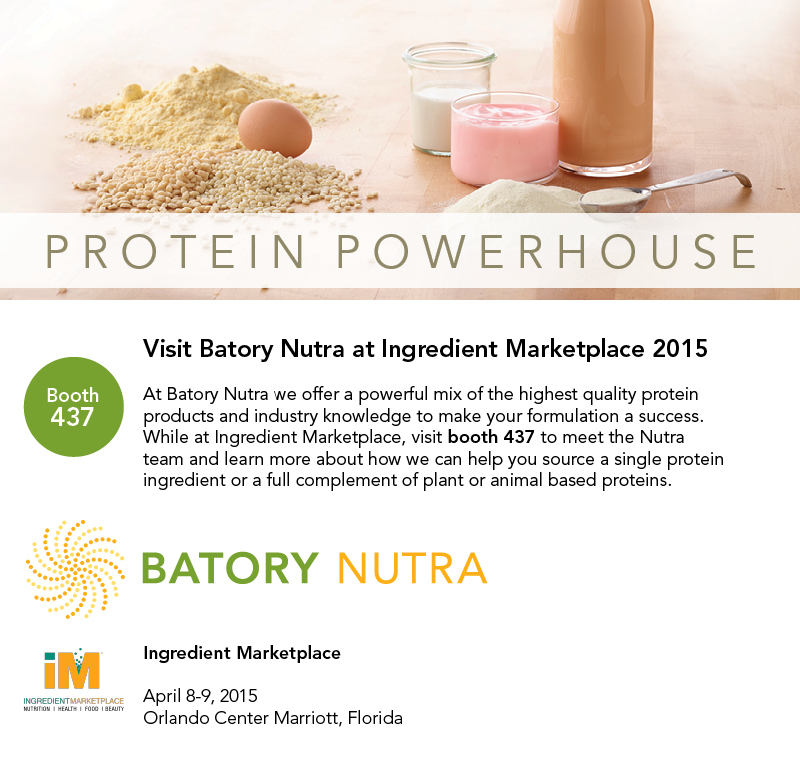 At Batory Nutra we offer a powerful mix of the highest quality protein products. Our Protein Experts use their knowledge and expertise of the commercial markets to provide insights in their respective areas of focus. Read the entire Market Update by clicking the link below. At Batory, we are working tirelessly to mitigate the impact of the epidemic, which has hit suppliers across the U.S., including our own egg supplier. We’re confi dent that our national scale, service excellence and far-ranging portfolio offer several advantages—not least the expertise to problem solve with customers. As many of you now, the nation is in the midst of a truck driver shortage. Although the issue is national in scope, we believe every delivery is personal. As such, we pledge to stand by your side and work through every complication, including those based on factors beyond our control. At Batory Nutra we offer a powerful mix of the highest quality portein products and industry knowledge to make your formulation a success. While at Ingredient Marketplace, visit booth 437 to meet the Nutra team and learn more about how we can help you source a single protein ingredient or a full complement of plant or animal based proteins. October 1, 2014 (Des Plaines, IL and Dallas, TX) — Batory Foods, a leading distributor of high-quality ingredients for U.S. food manufacturers, has reached an agreement with Celanese Corporation, a global technology and specialty materials company, as a select distributor of the new Qorus™ sweetener system. Developed by Celanese, Qorus™ balances flavor and sweetness while masking off notes. This empowers manufacturers to develop low- and no-calorie foods and beverages that taste as authentic as their full-calorie counterparts. Typically, product developers sacrifice taste for caloric reduction. With Qorus™, however, Batory customers can deliver the delight of uncompromising sweetness—without the calories of sugar. Qorus™ significantly reduces the bitter aftertaste of traditional no- or low-calorie sweeteners and increases sweetness perception. The optimizer inside the Qorus™ sweetener system does not add its own taste. Qorus™ functions in a variety of processing conditions and is designed for no- and low-calorie carbonated and non-carbonated beverages, flavored waters, energy and juice-based drinks, dairy products, cocktails and many more applications. Batory offers Qorus™ in two platforms: Dolce 1100 (30% to 70% sugar reduction) and Dolce 2100 (50% to 100% sugar reduction). While formulators enjoy the innovation potential of Qorus™, operations professionals appreciate the savings. Qorus™ reduces the need for proprietary flavors or masking agents, introducing time and freight cost efficiencies. With fewer truckloads required, Batory customers experience reduced man-hours, dock hours, handling and storage. The distribution partnership with Celanese also allows manufacturers to leverage Batory’s strength as a single-source ingredients provider. Customers that may have otherwise purchased flavorings or masking agents from different vendors can turn to Batory for a complete sweetener solution. Celanese Corporation is a global technology leader in the production of differentiated chemistry solutions and specialty materials used in most major industries and consumer applications. With sales almost equally divided between North America, Europe and Asia, the company uses the full breadth of its global chemistry, technology and business expertise to create value for customers and the corporation. Celanese partners with customers to solve their most critical needs while making a positive impact on its communities and the world. Based in Dallas, Texas, Celanese employs approximately 7,400 employees worldwide and had 2013 net sales of $6.5 billion. For more information about Celanese Corporation and its product offerings, visit www.celanese.com or our blog at www.celaneseblog.com. Milne Fruit Products selected Batory Nutra as an exclusive distributor within the dietary supplement market for its MicroDried® fruit & vegetable powders. This agreement provides Batory Nutra the opportunity to offer our customers a line of high quality, non-GMO fruit & vegetable powders which are produced using a specialized, patented drying process. Milne starts with the whole fruit. Then using advanced micro-drying technology a low-moisture fruit or vegetable powder is created that preserves ORAC and polyphenol levels and retains the original color and natural flavors for results superior to other conventional drying processes. These powders are suitable in a wide range of dietary supplement applications. Companies looking for a guaranteed source of fruit purees and concentrates can find them through Batory. SVZ Fruit Ingredients B.V. has selected Batory to distribute their purees and concentrates within the food and nutraceutical marketplace. Suitable for many applications from bars to beverages, SVZ partners with their growers from around the world to work together in developing, planting, growing and harvesting high quality and desirable fruits and vegetables. 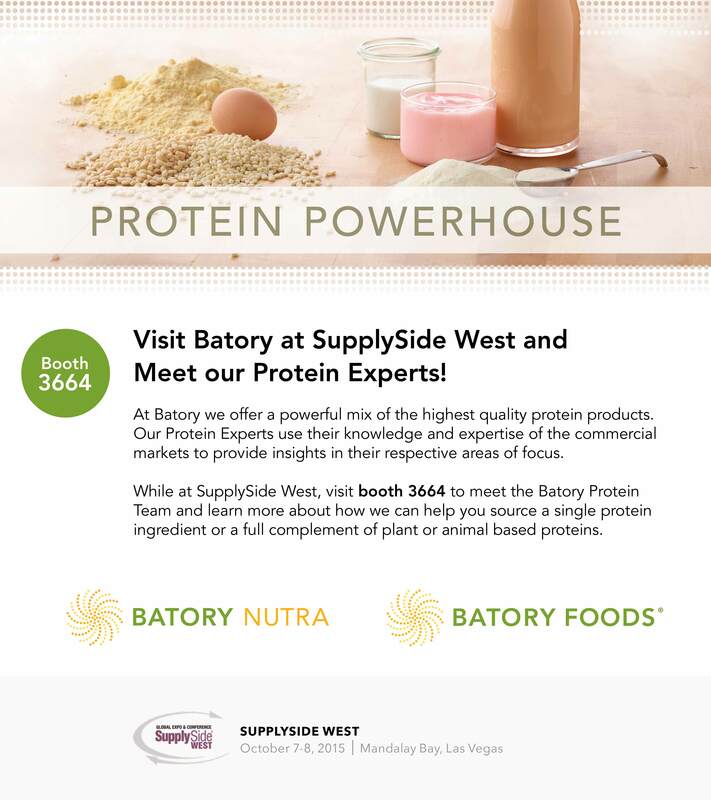 Visit Batory Nutra in booth #33080 at SupplySide West in Las Vegas, Nevada, October 6-10, 2014. This is the largest North American ingredient trade show targeting the nutra and supplement market. Batory Nutra offers products and services specifically tailored to the needs of the nutra market. With warehouse and distribution centers in strategic locations around the country our logistics is second to none. Our sales force is poised to provide exactly what you need when you need it. Visit us at booth #33080 to start our business partnership as your nutra supplier.